We’re rolling through the summer at KALW, working with more trainees than we’ve ever hosted before. Twelve adults and six high school students, all building their skills in our working newsroom. Today I’ll share a bit about our summer high school internship, which just wrapped up last Thursday. 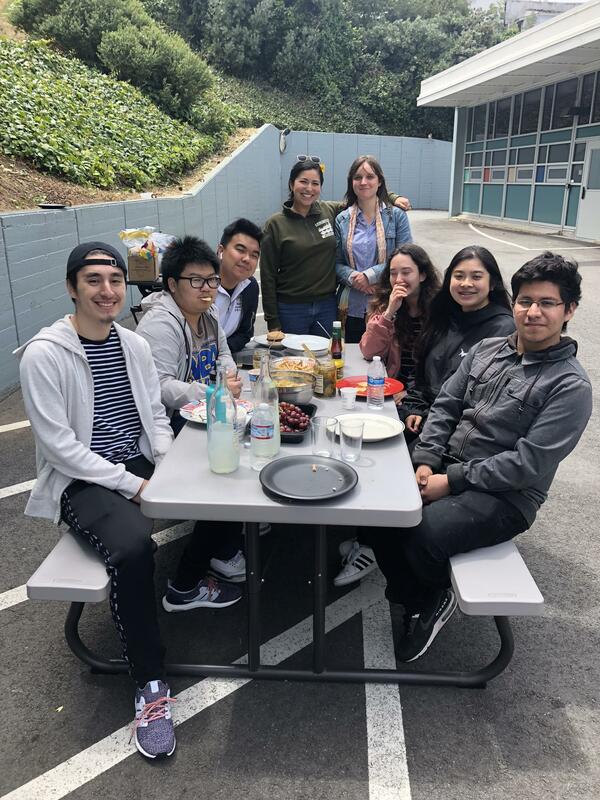 Julian Rodriguez, Jiahao Chen, Andy Xie, instructor Marisol Medina Cadena, instructor Holly J. McDede, Zoe Burleson, Ashlee Nguyen, and Christopher Olvera celebrate their last day interning with the KALW news department. This is a paid program for students in the San Francisco Unified School District. We’ve welcomed them to KALW for six years, now, and we’ve developed some great training techniques with the support of the Association for Continuing Education. 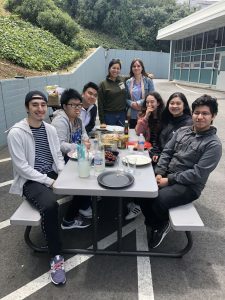 Our instructors, Holly J. McDede and Marisol Medina Cadena (who graduated in 2018 from our Audio Academy training program), did an outstanding job helping the students feel comfortable, directing them through a structured learning process, and producing the stories they reported, which we’ll all be able to hear on KALW the first full week of August. I had the chance to talk with the teenagers quite a bit this year, as they all took part in our morning conference calls to discuss the news of the day affecting the Bay Area. I also always dropped in to their classroom as they gathered to start their lessons. I was really struck by their engagement, focus, and camaraderie. It’s such a pleasure to be around motivated students! My experience at KALW was a good one. I didn’t think I would have so much fun during this internship. Everyone was very welcoming and friendly, albeit intimidating — especially during the conference calls. I learned so much in such a short amount of time, it’s crazy. I really pushed myself out of my comfort zone to talk to new people and to adjust to different situations. A giant thank you to everyone! This summer went by really fast. I don’t even notice this is the last day of the internship. I really enjoyed making my own story, and I never thought about it. Also, I really like the people in KALW, because they’re really nice and friendly. It makes me comfortable to work in this environment. Last but not least, I really like the cats. I never saw a cat or any animals in my past internships. It’s pretty cool. Thank you for the support and the amazing opportunity. Working at KALW over the past six weeks has been a great experience. It’s been very fun to explore all the aspects of radio production hands-on. I especially enjoyed the fact that all of the tools we used, such as the recorders and editing software, were all industry-standard — the types of tools that professionals in the field may use. I also enjoyed the independence that you get while working at KALW, because while other jobs may give you a specific task to accomplish, at KALW, the project you are working on is yours, and it is something that you want to be working on. Everyone at the station is very nice, and there’s definitely a greater culture found here than you would find elsewhere. I enjoyed my internship at KALW. To be honest, I didn’t expect to be doing work like this, meaning having work that has so much involvement. Whenever I go to the Friday classes, it’s always complaints on how they don’t do anything but shred papers or filing. Everyone complains while I’m sitting like, “Mine isn’t bad.” With writing a reflection in mind, my favorite parts were when we all came together and just talked, whether it be what we did over the weekend or recent news. It felt like we were just hanging out, and it made me feel closer to everyone. Having the opportunity to partake in this summer internship has truly been a blessing. I have learned so much, ranging from social skills, to tech skills, to learning about every one of the people around the building. Some of the highlights from this internship include: sitting in on the live conference call that took place; interviewing and meeting people around the building; and doing/completing my audio story. I am glad that I was gifted this experience and got to experience it with everyone I did. I felt like we all meshed well and all had different backgrounds along with personalities. That goes for everyone here at KALW; I feel like there’s a great blend of personalities and POV’s scattered throughout. Without this opportunity, I wouldn’t have learned a lot of the things about myself that I learned here. Overall, it has been an amazing experience, and I am very glad that I got to go on this journey along with you guys! My summer here at KALW has truly been a spectacular one. I’ve learned so many things about radio journalism but still have so many more questions. Learning about recording techniques, such as room tone, where to aim the microphone, the settings of the microphone, and the levels were just some of the skills that I learned. I also got the experience of interviewing people, looking at how radio stories are made, from start to finish, and got to experience that myself with my own story.